Culture of Lobsters juveniles (P. polyphagus) is popularized under the Tribal Sub Plan project for increasing earnings of Tribal fishers in Maharashtra. Monitoring of environmental parameters salinity, pH, temperature, DO, turbidity, BOD, bacterial contamination (TPC) and heavy metals in the fishing areas revealed severe deterioration of seawater quality in the creeks and inshore waters but relatively cleaner offer shore waters around Mumbai. Water, sediments, fish, crustacean and molluscan tissue samples for pre decided heavy metals to study bioaccumulation and biomagnifications are collected for analysis. Impact and yield study of environmental changes on distribution shifts in small pelagics along the Maharashtra coast have been undertaken for oil sardine and mackerel. Estimated plastic and litter composition and its quantification from 30 beaches of Maharashtra coast. mKRISHI® technology: Initially direct beneficiaries in the Raigad district were 20 that is enhanced to 45 now and indirect beneficiaries in Mewat, Dhar, Ganjam and other districts by IARI and TCS are approximately 3000.
mKRISHI® Fisheries technology: mKRISHI®fisheries Service mobile handsets were distributed to 330 beneficiaries in 56 fishermen cooperative societies. Expansion of mobile signal in deep sea was tested off Raigad coast up to 30-33 km. Commercial launch of mKRISHI® Fisheries mobile technology was released through Public Private Partnership (PPP) mode for public. Wheeled Ice-boxes with pulling handles and lifting mechanism: Ice boxes of different capacity (40, 50 & 100 litres) are used to keep the quality of fish intact, save revenue and reduce manual efforts. These boxes are useful for small, marginal and weaker petty sellers including women. Sturdy 100 litre ice boxes are used in return boat trip in sunny conditions. Saguna Rice Technique: About 300 stakeholder and farmers were sensitized to this technique. Hundred DVD’s of a documentary were released along with booklets in English and Marathi. Created awareness on the shark conservation to the fishermen of Palghar Dist.,of Maharashtra. Biodiversity indices of marine fishery resources caught in trawl net and Dol nets were estimated and reported. Estimation of phytoplankton, zooplankton and benthos diversity as well as their quantifications was done. 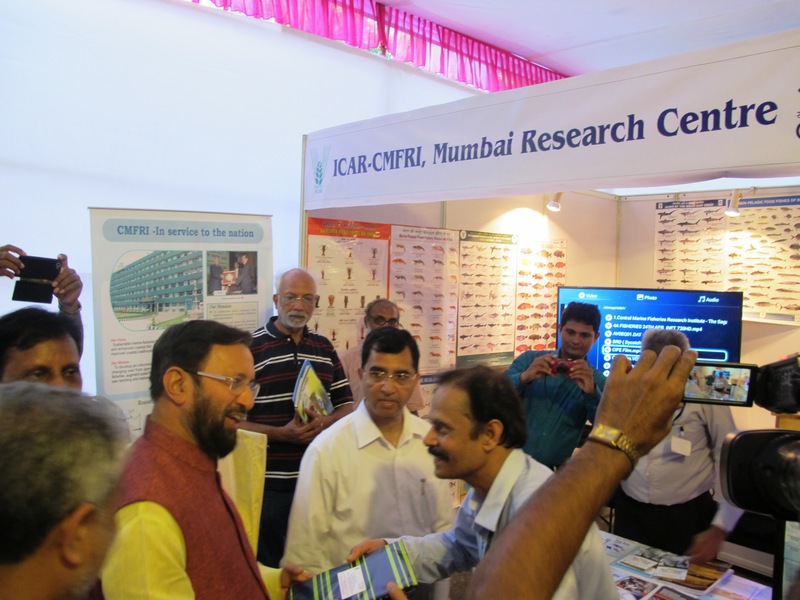 Database of corals and associated flora and fauna were reported from Sindhudurg Dist.of Maharashtra, Goa and Karwar, Karnataka. Awareness and training were given to the officials of Forest Dept., Fisheries Dept., Animal Husbandary Dept., Customs Dept., and the local fishermen regarding the stranding and sighting of Marine mammals in Sindhudurg Dist.,of Maharshtra.